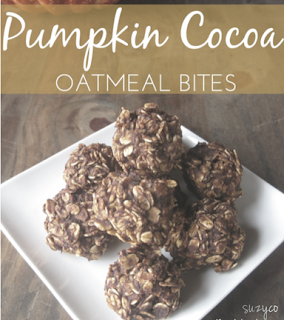 These pumpkin cocoa oatmeal bites only have 6 ingredients and take about 20 minutes start to finish! Pumpkin season is my favorite time of year. I love pumpkin recipes, pumpkin decorations, and right now my little one's favorite book is Patty's Pumpkin Patch. We have read it about 50 times in the last few days. I have made pumpkin oatmeal bites but adding cocoa to these pumpkin bites really takes them to another level. I like them even more than the original! In a medium bowl, combine the pumpkin, cocoa, cinnamon, honey, and eggs. Roll the dough into balls about the size of a ping pong ball. Bake at 350 for ~12-15 minutes. They are perfect as a quick breakfast or a snack. Unfortunately, they just won't last very long since they taste so frickin good! For more recipes, nutrition & tips join the suzy&co newsletter.